When World War Two dawned, the Royal Navy’s Fleet Air Arm found itself woefully short of fighter aircraft. They started adapting land based types for carrier use: the Gladiator, Spitfire, and Hurricane were soon adapted into the Sea Gladiator, Seafire, and Sea Hurricane. While the Sea Gladiator was outdated, the Sea Hurricane and Seafire soldiered on until U.S. types such as the Hellcat and Corsair were available in large numbers. Of the two, the Sea Hurricane was probably the better carrier type, being less delicate than the Seafire. Dartmouth Maintenance Pool. They were allocated the 1 and 2 codes in 1942. While the Sea Hurricane never served in the Royal Canadian Navy, it was, ironically, operated by the Royal Canadian Air Force. 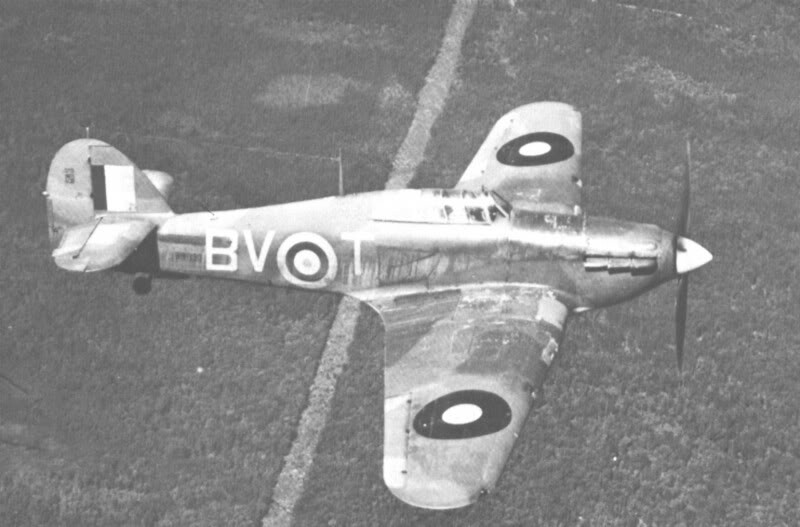 In late 1941, the RCAF found itself without any frontline fighters, having sent its earlier Hawker Hurricanes off to the UK along with 1 (F) Squadron RCAF, and was having a hard time procuring additional fighters to meet its needs. For reasons that are still slightly unclear, the RCAF received 50 Sea Hurricanes in 1942. It is assumed that these aircraft, built in Thunder Bay, Ontario by Canadian Car and Foundry, were to be used as part of the Fleet Air Arm Merchant Ship Fighting Unit (MSFU) based in Canada, but were diverted to the RCAF. These Sea Hurricanes were basically a Hurricane Mark I with a tail-hook, catapult spools, a short blunt DeHavilland spinner, and an eight gun wing. The Sea Hurricanes carried serials BW835 to BW884 and entered into RCAF service with hooks retained, ROYAL NAVY painted on the fuselage, and painted in the Fleet Air Arm scheme of Extra Dark Sea Grey and Dark Slate Grey over Sky. Though photographic proof is scant, it appears that some aircraft had their tail-hooks removed during their RCAF service or that some of the aircraft were MSFU Hurricanes without tail hooks. Most of the Sea Hurricanes spent their time flying out of Dartmouth, Nova Scotia on strength with 126 (F) Squadron. (Oddly, 118 (F) Squadron was heavily involved with Sea Hurricanes at the time even though it was not a Hurricane squadron. The unit flew both with RCAF Sea Hurricanes and MSFU aircraft and appears to have accepted many of the RCAF Sea Hurricanes from the manufacturer.) In 1943, the Sea Hurricane survivors were returned to Canadian Car and Foundry and upgraded to Hurricane XIIa status. This involved fitting US made Packard Merlin engines and the related fuselage extension, removal of the tail-hooks, and a repaint into the standard RCAF Hurricane scheme of Dark Earth and Dark Green over Sky. After the return to service, most of these Hurricanes were allocated to 1 OTU in Bagotville, Quebec, for training purposes. 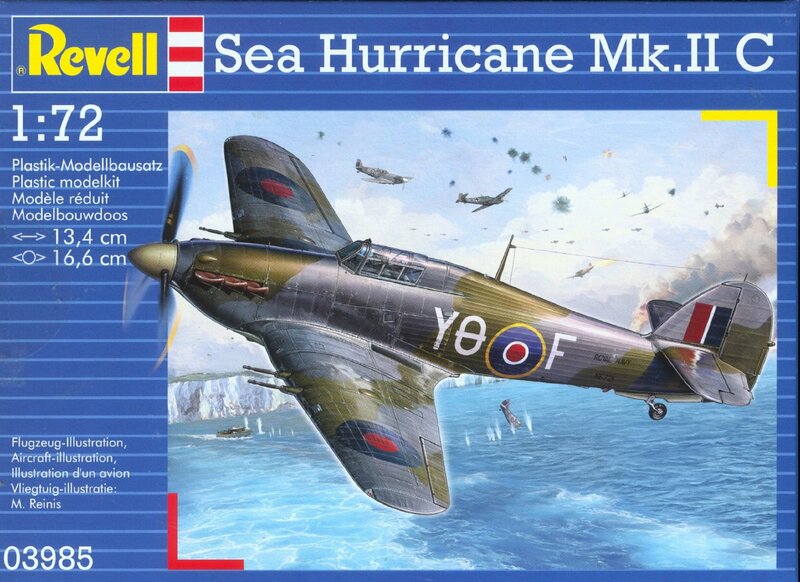 The first actual Sea Hurricane kit to be released in 1/72 scale was Revell’s Sea Hurricane IIC which appeared in 1999. Not appropriate to build as an RCAF Sea Hurricane, this is the later cannon armed version flown by the Fleet Air Arm. The kit has recently been reissued by Revell and makes into a neat model. The breakdown of the kit parts is rather complicated, especially the wings that are made up of five separate pieces. The fit is good, but it does take some care. Revell provides the rear fuselage insert and tail took, but the modeler is left to make up the catapult spools if he or she wishes. Cockpit detail is simple but effective with a decal instrument panel. The clear parts may not be as clear as many would wish. Sadly, the kit does have some accuracy concerns. The doghouse area of the rear fuselage under the canopy is not depicted, the spinner and propeller are not prototypical, and the rear fuselage fabric detail is slightly heavy. (The wings are also too large in chord.) That being said, it does resemble the Sea Hurricane when finished and the price is right. More recently, Airfix has issued a combined Hurricane IIC/Sea Hurricane kit. Unlike the Revell kit, this is a conversion in a box. The kit does provide the tail-hook and the fuselage insert, but the kit is molded as a Hurricane and the modeler is instructed to cut open the fuselage to fit the insert. Again, the catapult spools are not provided. The kit itself is a mixed bag; the fuselage fabric is beautifully done, but the recessed panel lines and rivets are very heavy. The moldings are quick thick and detail is lacking. However, it does build up reasonably well, and outside of the surgery necessary to build the Sea Hurricane, would make a good first effort for a beginner. Sadly, again, there are accuracy issues. The propeller is comically small, the spinner is, again, not prototypical and the canopy is larger in length than it should be which makes the whole fuselage look odd. In addition, the horizontal stabilizers are too small and the elevators are the wrong shape. Decals are provided for a mostly white Sea Hurricane from the HMS Nairana named “Nicki.” Even with it being the newer kit, and again, at a nice price, I would still recommend the Revell kit over the Airfix Sea Hurricane if the modeler is looking for a 1/72 example for their shelf. Earlier this year, I mentioned that I wanted to give AK Interactive's True Metal paste a try. I was able to get a tube of the aluminum a few months back and broke it out recently. The testbed was an Airfix Spitfire that had been sprayed with Mr. Finishing Surfacer 1500 Black. I did not polish the primer. Once it had been given time to dry, I applied a bit of paste with a Q-tip. A little goes a long way and I probably overdid it. I gave it 24 hours to dry and then polished it up a little with another Q-Tip. After another 24 hours, I tested durability. Masking with Tamiya tape caused almost no pigment lifting, but the paste must have not fully dried, as it still marked with a fingerprint. However, after a few more days drying time, the paste has cured and it is now immune from fingerprints, though some of the silver does rub off on my finger. (I will need to see if a Future overcoat effects the shine.) My finish is not perfect and I think that I will be more sparing with the paste next time. I do like the patina that is created with the paste and while not the silver bullet for natural metal finishes, this is an interesting product that would help create a very weathered natural metal finish. It also offers the added benefit of being able to apply it by brush or Q-tip so no airbrushes need to be harmed. The AK tube was quite expensive, but as so little is used, it may be a lifetime supply. As a test, I also dug out my Rub 'n Buff silver leaf tube as a test sample. It is interesting to compare the smells of the two tubes, clearly they are not the same formulation. (The AK tube has a slightly stronger smell, but the Rub 'n Buff has more of a solvent smell.) I was able to get a slightly thinner coat of the Rub 'n Buff on the other side of the fuselage. The Rub 'n Buff has less of a patina than the True Metal and is more uniform in shade. I did not feel that it buffed up as much as the AK product. It also held up to the tape test, and took quite a few days to fully cure, but like True Metal, it now seem impervious to fingers. It is interesting that metal paste has made a reappearance in the modeling community and I'm excited to give both products a try on a real project sometime in the future. 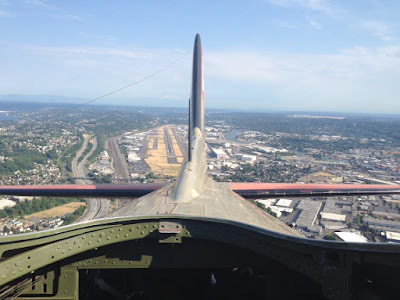 On Father's Day weekend 2015, the Historic Flight Foundation held its annual Biplane Weekend. One of the highlights was the Foundation's new Travel Air 2000 NC2937. Ex-RCAF Mitchell Mk. II KL161/N88972 was back in town after a winter repaint. The B-25D still wears the markings of Mitchell Mk. II FL176/VO-B of 98 Squadron Royal Air Force, but the new paint looks much better. The original Grumpy flew a record setting 125 Ops before being retired from action in August 1944. The Museum's Texan N512SE sitting on the grass. Notice the B-52 in the background. Two fine North American types. T-28B Trojan N63NA in U.S. Navy training colours. Also in attendance was the Commemorative Air Force's Rise Above traveling exhibit. It is not unique to see a high back P-51 parked in front of the trailer, but usually it has a red tail. As a side note, these photos also show how variable the Seattle weather can be; they were all taken over the span of 48 hours. 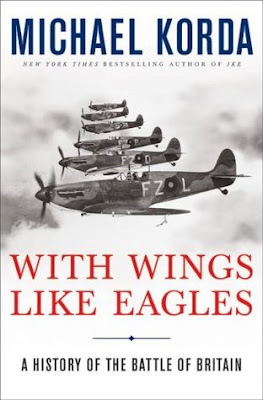 As 2015 is the 75th anniversary of the Battle of Britain, I decided to read a few of the newer books on the topic. The first on the nightstand was Michael Korda's entry from 2009. This is a breezy 322 page book which focuses more on the political background and tactics of the battle than individual aircrews. Korda is clearly a huge fan of Air Chief Marshal Sir Hugh Dowding and much of the narrative is discusses his decisions, leadership, and conflicts with other RAF members. It is interesting to learn that while Prime Ministers Baldwin and Chamberlain are often considered as appeasers, much of the technology of the Battle...Hurricanes, Spitfires, and radar...were funded under their watch. As expected, Nazi incompetence and ignorance was a huge part of why the Luftwaffe could never wipe out the RAF, but it was interesting to read just how incompetent they actually were. (For example, German intelligence made no effort to conduct any human intelligence with regard to Fighter Command air stations.) Sadly, Korda makes a few bloopers when it comes to aviation, both in the photo section and on the dust jacket: a flight of Bf-109s are identified as Bf-110s, Keith Park is pictured in a Harvard, not his personal Hurricane as the author suggests, a photo of a Hurricane and Spitfire was not taken during the Battle, no matter what the caption says, and the Hurricane was not an all metal fighter as identified on the dust jacket. While not an in-depth study of the aircraft or aircrew that fought on the front lines, this is a good introduction to the Battle and the behind the scenes politics on both sides of the channel. On May 27, 2015, Grumman EA-6B Prowler (BuNo. 161844) of VAQ-134 made its final flight. The Prowler was being donated to the Museum of Flight at Boeing Field and made the short hop from NAS Whidbey Island. This is the penultimate EA-6B flight with the U.S. Navy before the type is retired from service. The final Prowler flight will take place on June 27, 2015, when a specially painted EA-6 will leave NAS Whidbey Island bound for NAS Point Mugu, California to join the base museum. BuNo. 161844 was demilled in the days following its arrival and is now on display at the Museum of Flight, parked along with the Concorde and a Boeing Dreamliner in the Air Park. I guess even fighter pilots need to take selfies. Well done, fine steed. Enjoy retirement at the Museum. Modeler's Note: It is a little surprising that, for an aircraft which served in the U.S. Navy for over 45 years and was flown extensively in combat, only two Prowler kits have been issued in 1/72. The better of the two is the Hasegawa kit, which, while an older kit, still holds up. The Matchbox kit has substantially less detail, but it does have folding wings.